Something special is going on at the Winery for a limited time only until Sunday May 5. 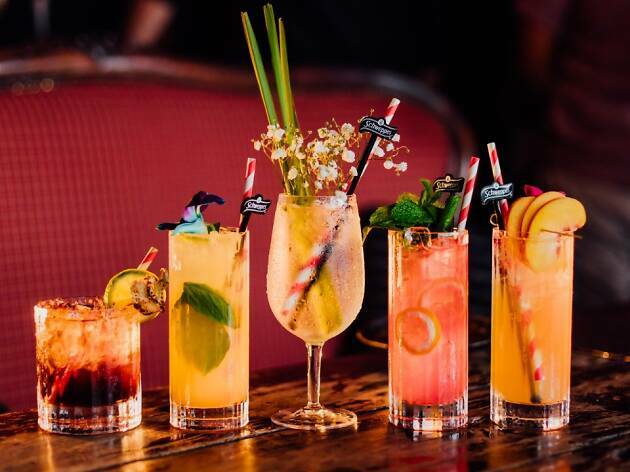 Schweppes are taking over the venue with Bar Schweppes, a month-long pop-up celebrating their new range of Signature Series Mixers and craft soft drinks. They have teamed up with three of the country’s best industry talents to create the first range of mixers advised on by professional bartenders in Australia. Enter: Charlie Ainsbury, the former co-owner of This Must Be the Place in Darlinghurst; Jess Arnott, top three in MasterChef Australia 2015 and ex-Chula in Potts Point; and Chris Hysted, three-time Australian Bartender of the Year. 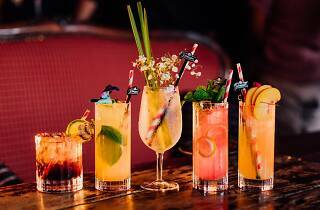 This gang have helped to come up with some elevated and versatile mixers that will appear in these sensational cocktails at $15 a pop, as well as at Dan Murphy’s stores nationwide. This cocktail uses Schweppes Signature Series Bright Tonic, which is made during a 12-month process and less bitter on the palate than your average tonic with the addition of orange oil, lemon oil and Javanese cinchona bark (which adds the necessary quinine to make tonic water). The tonic is then added to gin, blanco vermouth and elderflower cordial, and the whole thing is topped with lemongrass and baby’s breath to deliver a refreshing and citrusy kick to the classic G&T. This one is a perfect starter to ease your way into the rest of the list. A Tom Collins that switches out gin for white rum, this drink is the one to try if you’re looking for something a little more adventurous. They haven’t forgotten the lemon element of the cocktail, which comes in the form of the new Signature Series Lemonade, developed by blending the oils of lemons and limes at a frosty temperature and then adding Italian lemon essence to create a mixer that is smooth and clean. Add pomegranate and lime syrup and a sprig of mint to garnish and you have a cocktail as enticing as it is innovative. If you want to lift your vodka, lime and soda game, don’t look past the Whiplash Spritz on the menu. Vodka and lime juice are standard, but pour in some passionfruit syrup and you’ve got something a little more interesting happening in that glass. But the star of the show is the Signature Series Soda Water, which contains Colorado mountain salts, providing the perfect undercut to the sweetness of the passionfruit. Top with basil and passionfruit pulp and you’re ready to enjoy a cocktail that will make you the envy of the group. The classic Highball is simply a class of cocktail that involves a spirit and a mixer. The Bright Highball is of another order entirely, combining gin and fino sherry (the palest and driest of sherries), plus the zing of lemon juice and peach bitters, with the key ingredient: Schweppes Signature Series Bright Tonic. This is a tonic steeped in oranges and lemons and combined with quinine from Javanese cinchona bark. The garnish here is peach slices and a white orchid, and to enhance the sensory experience an atomiser scent of lemon oil is sprayed over the cocktail before serving. This is the Moscow Mule’s better-looking cousin. The only similarity between the two drinks is the ginger element, and this one definitely wins out because it’s made with Signature Series Dry Ginger, a complex ginger ale with subtle spice thanks to the Indian chilli added after the ginger is cold-pressed. Add spiced rum, a hint of coffee liqueur, a dash of chocolate bitters and a lime wedge to cut through the sweetness, and you have a beautifully balanced tipple looking like liquid gold. Bar Schweppes runs until May 5 with a fitout of sparkling translucent and silver bubbles floating through the Winery and its courtyard and the additional pop-up Botanical Bar in the laneway, where you can customise your own drinks with the help of the Winery’s professional mixologists. The Botanical Bar is open 5-8pm on weekdays and 2-8pm on weekends. A pop-up cocktail bar has opened at Surry Hill's The Winery just this month, and here are five botanical concoctions you need to try.